My usual recipe for potato soup came from my mom and, frankly, is pretty much just thin mashed potatoes with garlic and Parmesan. It's very good, don't get me wrong. But dinner last night was a step up, and still very easy. Because in case I haven't mentioned, I like easy. I also love comfort food, which this definitely qualifies for. And with the addition of kale, I can almost pretend that it's healthy. Which it probably would be, if I'd cut back on the butter and cured pork. -Scrub potatoes (I never peel my potatoes) and cut into 1/4 inch sized pieces. Add to pot of cold water along with 2 or 3 cloves of garlic. Bring to a boil, cover and reduce heat to maintain a low boil. 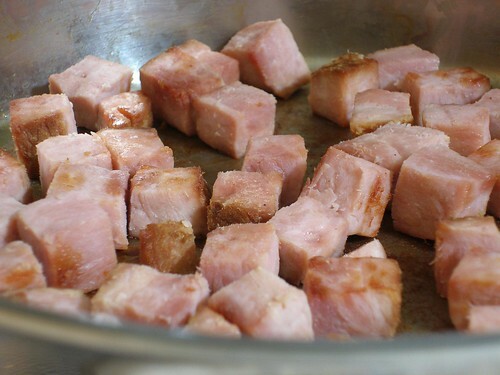 -Cut the ham (or bacon) into bite sized pieces and brown it in a skillet. -Move the ham to the side of the skillet. 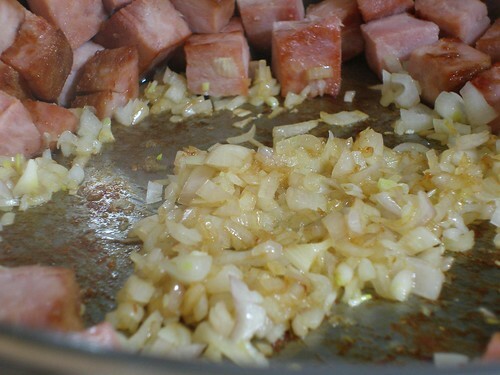 Add a tablespoon or so of olive oil to the middle (if using ham), followed by the shallot. Cook, stirring regularly, until it's browned. It'll pick up all the nice browned bits on the skillet, which is a very good thing. 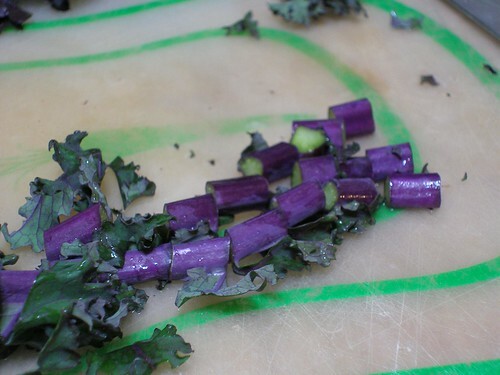 -Cut the stems of the kale into 1/4 inch pieces. -Stir these in with the ham and shallot. Add 1/2 cup of water and cover. 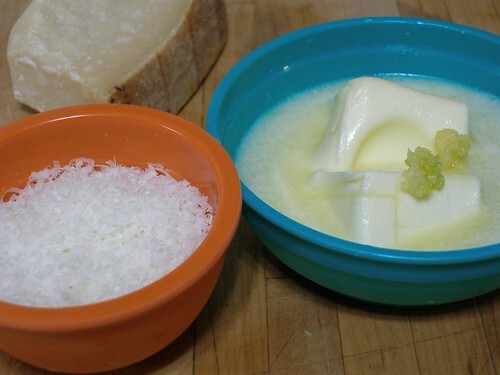 -Mix together one stick of the softened butter, one clove of garlic that's been through a garlic press and half of the Parmesan. -Slice the bread, butter one side of each piece with the mixture and place on a broiler pan, buttered side up. -At this point, the kale stems should be somewhat softened. Chop the rest of the kale and add it to the skillet. If it looks dry, add a bit more water. Cover and let cook. -In a microwave safe bowl (I usually use a big glass pyrex measuring cup), heat the milk until hot. Set aside. -When the potatoes are cooked through, drain them, reserving some of the liquid. -Return to the pot and mash. You can do this as smooth or as chunky as you like, just make sure to completely mash the few cloves of garlic that still are in there. -Season with salt and pepper and the remaining Parmesan. -Put over low heat to keep warm while you put the bread under the broiler (about 4 inches from the element) until it's nicely browned. I never do this step while I'm trying to do other stuff in the kitchen because that always leads to disaster. -Serve with extra Parmesan and the toasts on the side. 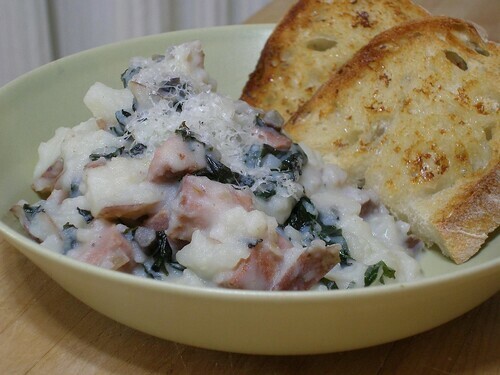 After I made it, I realized that the recipe is basically a version of Colcannon, Irish peasant food. So, just curious... do any of you out there have your own versions of this? Yum, that looks so good! I usually only make potato soup once a year, in the winter. Don't know why I don't do it more often because it's so good, but I'm usually a 'clean out the fridge chicken soup' person. I'm not a fan of kale, so I usually add teesny tiny pieces of zucchini. I also don't peel my potatoes, and I like them chunked instead of mashed, with a medium thickness of soup as opposed to too thin or too thick. I just use a can of chicken broth to thin it out. So basically it's just like yours except for the kale! And I think I'll do this for New Year's Eve, because it's going to be in the 40s during the day all week, and nighttime temps in the 20s. Perfect idea! Oh, forgot to say that I love your photos of all of this! Isn't it funny how a photo can make your mouth water? I'm astounded that I have not made this considering my great love for all things potato. I do live in Idaho, but that's probably not why I love them so. This is on the list after tacos tonight and chicken noodle soup tomorrow night. I just noticed your chicken and noodles in the sidebar, so I'd better go see what that's all about before I get cooking. Hope your holiday was wonderfully good. That look so good! Especially the bread on the side of the plate! Yum! 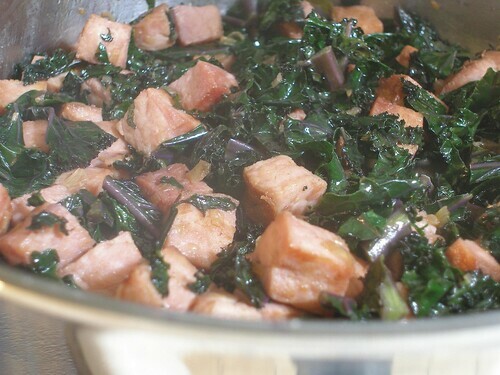 I love kale and am always looking for more ways to cook with it. Right now it goes in my soup, but that's about it. wow, that looks amazing! thanks for sharing the recipe! Thanks for the great recipe! I love Colcanon and my husband is Irish so this recipe will have to go into my cookbook! I can feel my arteries harden as I speak of this, but I usually add a jar of Ragu cheese sauce to my potato soup. Plus I usually saute mushrooms along with the onions & ham. Instead of kale, I add steamed broccoli. Funny how everybody's recipes are just a little bit different, but they all sound good. I usually serve sheepherder's or french bread (untoasted) because I'm too lazy. If they want it toasted, they can toast it. Besides if it's too toasty, it tears up the top of my mouth. Bummer. And yes, the pictures made my mouth water and my tummy grumble. Hmm, I wonder what's for dinner. Oh, my mouth is (literally!) watering as I read this! I love potatoes and ham and all that comfort food. Yum! Drooling here. 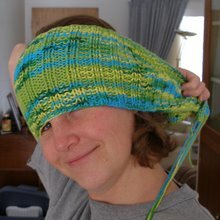 (also love that you love the *idea* of knitting! - that's farther than I've ever gotten). Oh, yum! This looks fantastic. The funny thing is, I made potato-and-leek soup last night for dinner, and was wondering to myself what other kinds of potato soup there might be out there to try. This one looks fabulous, and I love the kale! Will be trying this soon. Oooh...I'm going to have to try making this very soon! Looks so yummy!